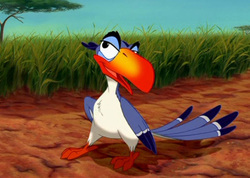 Zazu was the majordomo of Mufasa in The Lion King. Zazu is a feisty red-billed hornbill who first appeared in the Disney's 1994 film The Lion King and its sequels. He serves as majordomo to Mufasa, Scar, and Simba. 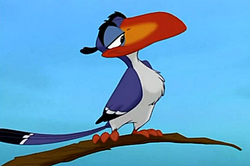 Zazu has had several voice actors portray him. Rowan Atkinson voices the character in The Lion King, while Edward Hibbit voices him in the two sequels. Michael Gough voices Zazu in its television series Timon and Pumbaa. Jeff Bennett provides Zazu's singing voice during the Morning Report sequence on the Platinum Edition of The Lion King DVD. As majordomo to King Mufasa, his proper, dignified, nervous, and easily-rattled personality is the polar opposite in temperament of Simba and Nala. He tends to panic during emergencies, such as the wildebeest stampede. As a youngster, Zazu was incompetent, talkative nuisance, but soon learns to distinguish between what's real news and what's not, though he's not above some juicy gossip. Despite his size, he's rather snobby and looks down on lowlifes, and is not afraid to use his dry, biting wit, and is a very loyal friend and servant to the royal family. 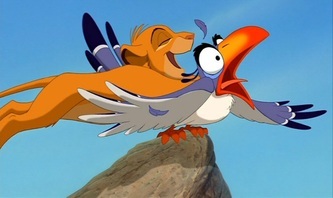 According to the children's book, The Lion King: Six New Adventures, in the story, "A Tale of Two Brothers", Zazu's mother, Zuzu, is asked by King Ahadi if she would take the position of advising the king. Zuzu is honored and immediately accepts his offer making her family serve as stewards to the lion kings of the Pridelands. Finally, when Zazu was young, Zuzu trains him to take her place when Mufasa's rule began. However, this is openly contradicted by the book, Friends in Need, in which a young Mufasa saves a young Zazu who is about to be cooked and eaten by Shenzi, Banzai and Ed. Zazu is thankful and hopes that he can be of service to the Lion King someday to which Mufasa is doubtful of. 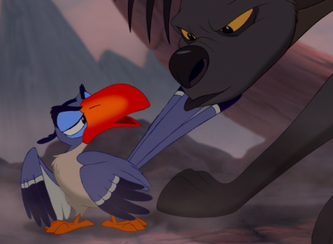 However, one day Zazu notices some vultures hovering and sees that Sarabi has fallen into a pit and can't get out. Zazu flies back to tell Mufasa who leaps up and runs to the gorge. Mufasa can't find a way to rescue Sarabi so Zazu finds a tree trunk that Mufasa drags over to the pit allowing Sarabi to climb out. Mufasa sees that the little hornbill is useful after all and appoints him to be his royal advisor. Zazu is first seen flying over the animals heading towards Pride Rock to see the newborn Simba, and bows before Mufasa when he lands on Pride Rock. Later, he is telling Mufasa the morning report, and is pounced on by Simba who was being coached by Mufasa on a pouncing lesson. When Simba and Nala agree to go the water hole, Sarabi instructs Zazu to accompany them to the "water hole" where they lose him during the song, "I Just Can't Wait to be King", but he finds them again at the Elephant Graveyard. During the encounter with the hyenas, he is captured by the hyenas to be exploded out of the birdie boiler. After Mufasa successfully fights off the hyenas, Zazu reappears, and frowned down by Mufasa for not protecting the cubs. Later, Zazu is with Mufasa near the gorge and are alerted by Scar that a wildebeest stampede is occuring with Simba in danger. Zazu flies down to the gorge, and finds Simba hanging from the edge of a dead tree to which he tells Mufasa of. As he watches the stampede, he reacts in panic, and goes to look for help, but is struck by Scar into a wall and rendered. When Scar gives his eulogy to Mufasa and Simba, Zazu is shown comforting Sarabi. He also briefly appears in a scene after Scar has assumed the kingship of the Pride Lands. In this scene, Zazu is imprisoned and is being forced to entertain Scar by singing songs like "I've Got a Lovely Bunch of Coconuts" and "It's a Small World". When the hyenas come in to complain about the lack of food and water, Scar casually tells them to eat Zazu, and he frantically insists that he'd be "so tough and gamey and eyugh!" Later on, Simba returns to reclaim his throne. Simba, the lionesses, Timon, Pumbaa, and Rafiki battle the hyenas. Zazu pleads Timon to let him out of the ribcage he is imprisoned in, but Timon goes inside the ribcage instead as he is pursued by the hyenas. Pumbaa comes to the rescue and chases away the hyenas after Banzai accidentally insults him. Zazu is freed along with Timon, and he joins the battle. Finally, Zazu witnesses Simba's ascension to the throne and flies with white birds during the presentation of Simba and Nala's newborn cub. azu does not have a large role as he does in The Lion King, but is still seen throughout the movie giving news to Simba, mainly about where Kiara is. He is also the one who spots the Outsiders in the Pride Lands first and warns Simba. After witnessing Kiara's presentation, Zazu is next seen when Simba is lecturing Kiara that Zira and the Outsiders are "backstabbing murderers". Years later when Kiara is a full grown lioness, Zazu assures Simba that she will be fine until Simba notices a wildfire has started. Zazu is sent ahead by Simba to find Kiara, who had been out on her first solo hunt. When Zazu finds that Kiara is being rescued by Kovu, he reports the information back to Simba. 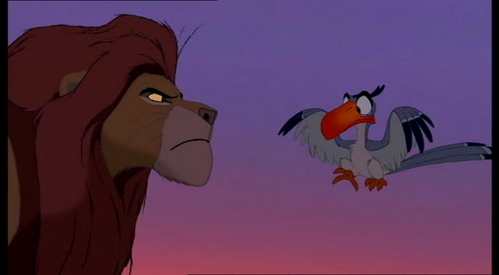 After Kovu asks to join the pride, Zazu notes that royal law demands that debts (such as the one Simba owes Kovu for rescuing Kiara) must be repaid, though he is quite happy to make an exception. Later, after Simba is injured in an ambush by Zira and the Outsiders, he is sent by Kiara to find help. Finally, near the end of the film, he reacts in panic when reporting that the Outsiders are preparing to attack. While at the same time, Simba learns that Kiara has fled the Pridelands to which Simba again sends him to find her. In the end, Zazu looks alongside Timon and Pumbaa during Kiara and Kovu's wedding to which Timon and Pumbaa start crying with happiness and Zazu covers himself from the wetness of their tears. 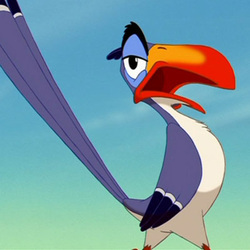 Zazu's appearances are extremely brief in The Lion King 1½. He is first seen at the presentation of Simba, talking to Mufasa about how the animals are kneeling before Simba. He is then seen with Mufasa alerting him that the hyenas are after Simba and Nala.